Ashley Fleming, and daughter Alisa, from Seaforde, with their champion and reserve interbreed dairy winners at Castlewellan Show. Thousands flocked to the County Down town of Castlewellan on Saturday for the local agricultural society’s 50th anniversary show. Among the spectators were retired pedigree cattle breeders Cecil and Molly Robinson from Ballygowan. They exhibited a Charolais heifer at the first show in 1967 and have been loyal supporters and key stalwarts of the organising committee over the years. Show chairlady Fiona Patterson has also had a long association with the show which has grown in popularity to become one of the largest agricultural events in the Northern Ireland calendar. “My mum Violet Bell was secretary of Castlewellan Show for 28 years, so it’s somewhat like a ‘family business’ for me.” Elected to the chair in November, Mrs Patterson, who is also vice chairman of the Northern Ireland Shows Association, said she was privileged to be associated with Castlewellan Show on its Golden Jubilee. Reserve Simmental champion was Jason Whitcroft's Whitdrum Vicky. Mrs McHugh awarded the 2017 trade stand prize to Ballyward Plant Services, with Len McCoy Lawnmowers taking second prize. Over 4,000 exhibits were catalogued across the livestock, equine, poultry, and home industries classes. The trade area boasted gourmet food, fashion and craft marquees, while there was a host of activities and attractions ongoing throughout the day. Show officials also paid tribute to Marjorie Adams who retiring after 10 years as secretary of the cattle section. Sisters Kristyn and Karis Greenaway from Birches near Portadown enjoying the atmosphere at Castlewellan Show. The Fleming Family from Seaforde led the dairy section with Jersey females from their noted Potterswalls Herd. Leading the beef interbreed line-up was the two-year-old Aberdeen Angus heifer Old Glenort Yvonne from James Porter’s 60-cow herd based at the Gillhall Estate near Dromore. Securing the reserve award was the Simmental champion Raceview Goldie Dreamer owned by David Hazelton, Dungannon. Second reserve honours went to the Salers heifer Lisnamaul Kelly exhibited by PJ Maginn and Sons, Downaptrick. Toast of the sheep section was the Suffolk champion, a shearling ewe owned by Robert and Jonathan Neill from Crossgar. Jim Bell from Comber claimed the reserve ribbons with his Charollais aged ram. Taking the second reserve award was a Texel gimmer from Alastair Gault’s Forkins flock at Newtownabbey. Jim Drayne Memorial Award for the native or traditional breed champion: James Porter. Reserve: Ciaran Kerr. Linden Foods Supreme beef championship: James Porter. Reserve: WD and JD Hazelton. EDA Media Ltd young beef bull championship: 1, Rodgers Livestock; 2, Duncan McDowell; 3, Thelma Gorman. Bank of Ireland young beef heifer championship: 1, WD and JD Hazelton; 2, Duncan McDowell; 3, N and M Moilies. John Thompson Ltd beef pairs championship: 1, Brian Johnston and Hylda Mills. Qualifier Bank of Ireland and NISA junior bull championship: Duncan McDowell. Qualifier McLarnon Feeds/NISA Dairy Cow Championship: Owen Martin. 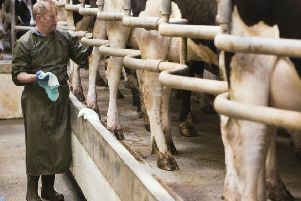 Dairy handler, aged 8 to 13 years-old: 1, Ailsa Fleming. Dairy handler, aged 14 to 25-years-old: 1, James Martin. Junior heifer, born on or after 01/04/16: 1, Owen Martin. Senior heifer, maiden or in-calf, born on or before 31/03/16: 1, Fleming Family. Heifer in-milk: 1, Fleming Family; 2, Owen Martin. Junior cow in-milk: 1, Fleming Family. Senior cow in third or more lactation: 1, Owen Martin; 2, Sunrise Shorthorns. Champion: WD and JD Hazelton. Reserve: Jason Whitcroft. Heifer, born in 2015: 1, WD and JD Hazelton; 2, Jason Whitcroft. Heifer, born in 2016: 1, WD and JD Hazelton. Bull, born in 2016: 1, Thelma Gorman. Pair, property of exhibitor: 1, WD and JD Hazelton. Champion: DG Green and Sons. Reserve: Martin McConville. Cow or heifer, born on or before 31/12/14: 1, DG Green and Sons; 2, Jim Quail. Heifer, born in 2015: 1, Martin McConville; 2, David Hamill. Heifer, born in 2016: 1, and 2, M, S and A Donaghy; 3, Jim Quail. Bull, born in 2016: 1, Martin McConville. ; 2, Jim Quail. Bull or heifer, born in 2017: 1, D G Green and Sons. Pair, property of exhibitor: 1, Martin McConville; 2, M, S and A Donaghy; 3, Jim Quail. Champion: Frank Reid. Reserve: Mark Ritchie. Bull, born on or before 31/12/15: 1, Frank Reid. Bull or heifer calf, born in 2017: 1, Mark Ritchie. Champion: Ciaran Kerr. Reserve: Courtney Halliday. Cow, born on or before 31/12/14: 1, AJ Farms; 2, J and K Taggart. Heifer, born in 2015: 1, and 2, Greer Watson; 3, J and K Taggart. Heifer, born between 01/01/16 and 31/08/16: 1, Courtney Halliday; 2, and 3, M and L Moore. Senior bull, born on or before 31/12/15: 1, Ciaran Kerr; 2, Alwyn Armour; 3, David Smyth. Junior bull, born between 01/01/16 and 31/08/16: 1, M and L Moore; 2, Mervyn Richmond; 3, Tracey Morton. Bull or heifer calf, born on or after 01/09/16: 1, James Graham; 2, T and S Andrews; 3, Tracey Morton. Pair, property of exhibitor: 1, Mervyn Richmond; 2, M and L Moore; 3, AJ Farms. Champion: Johnston Farms. Reserve: Rodgers Livestock. Bank of Ireland NI Blonde Calf Championship: 1, and 2, Johnston Farms; 3, Jim McCabe. Cow or heifer, born on or before 31/12/14: 1, Johnston Farms; 2, Ivaniskey Livestock. Heifer, born in 2016: 1, M Savage; 2, Johnston Farms; 3, M Savage. Bull, born in 2016: 1, Rodgers Livestock; 2, Johnston Farms; 3, Peter Ritchie. Bull or heifer calf, born in 2017: 1, Ivaniskey Blondes. Pair, property of exhibitor: 1, M Savage; 2, Johnston Farms. Young handler, aged under 14-years on 01/01/17: 1, Sam Mercer; 2, Eddie Mercer; 3, Matthew Mercer. Champion: James Porter. Reserve: Alwyn Armour. Heifer, born in 2014: 1, Alwyn Armour. Heifer, born in 2015: 1, James Porter; 2, and 3, Eric and Judith McClelland. Heifer, born in 2016: 1, Freddie Davidson; 2, and 3, Brian Johnston and Hylda Mills. Bull, born in 2016: 1, Brian Johnston and Hylda Mills; 2, Freddie Davidson. Bull or heifer calf, born in 2017: 1, Alwyn Armour. Pair, property of exhibitor: 1, Brian Johnston and Hylda Mills; 2, Eric and Judith McClelland; 3, Freddie Davidson. Champion: Trevor Dodds. Reserve: J and S Martin. Junior handler, aged 8 to 13 years: 1, Aran McGaw. Bull, born between 01/10/15 and 16/07/16: 1, J and S Martin; 2, Basil Dougherty; 3, Trevor Dodds. Bull, born on or before 30/09/15: 1, Trevor Dodds. Heifer, born between 01/10/15 and 16/07/16: 1, Trevor Dodds; 2, and 3, Ivan and Corrina Gordon. Heifer, born between 01/10/14 and 30/09/15: 1, J and S Martin; 2, Oliver McCann; 3, James Boyd. Bull calf, under one-year-old: 1, James Sloan. Pair, property of exhibitor: 1, J and S Martin; 2, Ivan and Corrina Gordon; 3, Basil Dougherty. ISA and Castlewellan Show Bank of Ireland British Blue Young Bull Championship: 1, J and S Martin; 2, Trevor Dodds; 3, Basil Dougherty. Champion: PJ Maginn and Sons. Reserve: Seamus Connell. Cow, any age: 1, PJ Maginn and Sons; 2, Seamus Connell. Heifer, born on or before 31/12/15: 1, PJ Maginn and Sons; 2, Pearse O’Kane; 3, PJ Maginn and Sons. Heifer, born in 2016: 1, Seamus Connell; 2, Pearse O’Kane; 3, George McCall. Bull, born in 2015 or 2016: 1, Seamus Connell. Bull or heifer calf, born in 2017: 1, PJ Maginn and Sons; 2, Seamus Connell. Pair, property of exhibitor: 1, PJ Maginn and Sons; 2, Pearse O’Kane; 3, Seamus Connell. Group of three: 1, PJ Maginn and Sons; 2, Pearse O’Kane; 3, Seamus Connell. Best NI-bred Saler: 1, PJ Maginn and Sons; 2, Pearse O’Kane; 3, PJ Maginn and Sons. Champion: Magowan Family. Reserve: DT Lester. Cow, any age: 1, and 2, Magowan Family. Bull, any age: 1, and 2, DT Lester; 3, Magowan Family. Bull or heifer calf, born in 2017: 1, DT Lester; 2, Magowan Family. Champion: James Porter. Reserve: Duncan McDowell. Cow or heifer, born on or before 31/12/14: 1, James Porter; 2, Cherryvalley Estate; 3, James Porter. Heifer, born in 2015: 1, Duncan McDowell; 2, J and S Martin. Heifer, born in 2016: 1, Duncan McDowell; 2, Rodgers Livestock; 3, Johnny Peters. Bull, born on or before 31/12/15: 1, Cherryvalley Estate. Bull, born in 2016: 1, Duncan McDowell; 2, Cherryvalley Estate; 3, James Sloan. Pair, property of exhibitor: 1, James Porter; 2, Cherryvalley Estate. Champion: Keith Livingstone. Reserve: Rodgers Livestock. Male or female, born in 2017: 1, Rodgers Livestock; 2, and 3, Doyle Bros. Male calf, under one-year-old: 1, Malachy McGrath; 2, Brendan O’Hare. Heifer calf, under one-year-old: 1, JCB Commercials. Heifer, over one-year-old and showing no permanent teeth: 1, Jonathan Davidson; 2, Colin Woodside; 3, Ivaniskey Livestock. Heifer or bullock, showing not more than two permanent teeth: 1, Keith Williamson; 2, Sydney Rea; 3, Nigel and Sandra Cochrane. Pair, showing no permanent teeth: 1, Brendan O’Hare; 2, Colin Woodside; 3, Sydney Rea. Champion: N and M Moilies. Reserve: Robert Boyle. Junior champion: Elizabeth Henning. Reserve: N and M Moilies. Cow or heifer, born on or before 31/12/14: 1, N and M Moilies; 2, Robert Boyle. Cow or heifer, born between 01/01/15 and 31/08/16: 1, Robert Boyle; 2, N and M Moilies; 3, Rachel Armour. Bull or heifer calf, born on or after 01/09/16: 1, Elizabeth Henning; 2, N and M Moilies. Champion: M and A Bloomer. Reserve: James McCullough. Cow or heifer, born on or before 31/12/14: 1, James McCullough; 2, M and A Bloomer; 3, Montgomery and McClenaghan. Cow or heifer, born between 01/01/15 and 31/08/16: 1, and 2, James McCullough; 3, Nigel McIlrath. Bull, born on or before 31/08/16: 1, M and A Bloomer; 2, Ryan Lavery; 3, M and A Bloomer. Bull or heifer calf, born on or after 01/09/16: 1, and 2, Montgomery and McClenaghan; 3, M and A Bloomer. Champion: Robert Boyle. Reserve: Arnold Pearson. Cow or heifer, born between 01/01/15 and 31/08/16: 1, and 2, Arnold Pearson; 3, Oliver Daken. Bull, born on or before 31/08/16: 1, Robert Boyle; 2, Arnold Pearson; 3, David Ruddell. Handler, aged 8 to 13-years-old: 1, Matthew Cochrane; 2, Lucy Rodgers and Victoria Workman; 3, Cole Hogg and Molly Bradley. Handler, aged 14 to 18-years-old: 1, Victoria Johnston; 2, Marcus Murdock; 3, Jason Whitcroft. Danske interbreed sheep championship: 1, R and J Neill; 2, Jim Bell; 3, Alastair Gault. Breed promotion award: 1, Charollais; 2, Vendeen. Pair of ewe lambs: 1, Alastair Gault; 2, Alison Graham; 3, R and J Neill. Group of three: 1, Jim Bell; 2, Alastair Gault; 3, J and C Aiken. Champion: J Aiken. Reserve: J Aiken. Ram, one shear and upwards: 1, J Aiken; 2, Jack Graham. Ewe, two-years-old and upwards: 1, and 2, J Aiken. Shearling ewe: 1, and 2, J Aiken; 3, Alison Graham. Ram lamb: 1, J Aiken. Ewe lamb: 1, and 2, J Aiken; 3, Jack Graham. Champion: Sean Doyle. Reserve: Hannah Robinson. Ram, one shear and upwards: 1, Hannah Robinson. Ewe, two-years-old and upwards: 1, Peter Lawson. Shearling ewe: 1, Peter Lawson. Ram lamb: 1, Sean Doyle; 2, and 3, Peter Lawson. Ewe lamb: 1, Sean Doyle; 2, Sam Todd; 3, Hannah Robinson. Novice breeder showing ram or ewe lamb: 1, Peter Lawson; 2, Sam Todd. Group of four: 1, Peter Lawson. Young handler, under 14-years-old: 1, J Wells; 2, S Todd; 3, Liam Doyle. Champion: Alastair Gault. Reserve: Ben Casement. Ram, two shear and upwards: 1, Ben Casement; 2, JW Watson; 3, Ciaran Cunningham. Shearling ram: 1, JW Watson; 2, Henry Gamble; 3, Cynthia Aiken. Ewe, two-years-old and upwards: 1, Alastair Gault; 2, Barclay Bell and Sons; 3, Paul O’Connor. Shearling ewe: 1, Alastair Gault; 2, Henry Gamble; 3, Naomi Ardis. Ram lamb: 1, Alastair Gault; 2, Naomi Ardis; 3, Ciaran Cunningham. Ewe lamb: 1, Alastair Gault; 2, Henry Gamble; 3, Ciaran Cunningham. Ram, one shear and upwards: 1, Sean Doyle. Ewe, two-years-old and upwards: 1, R Armour; 2, Sean Doyle; 3, Dan Gilchrist. Shearling ewe: 1, R and J Neill; 2, D Ford; 3, Alastair Gault. Ram lamb: 1, Mark Herron; 2, Henry and Monica Flynn; 3, Sean Doyle. Ewe lamb: 1, Alastair Gault; 2, R and J Neill; 3, Dan Gilchrist. Pair of lambs: 1, Alastair Gault; 2, R and J Neill; 3, D Ford. Champion: James Donaldson. Reserve: James Donaldson. Ram, two shear and upwards: 1, and 2, James Donaldson; 3, Stewart Adamson. Shearling ram: 1, and 2, James Donaldson; 3, Stewart Adamson. Ewe, two-years-old and upwards: 1, James Donaldson; 2, Harry Wright and G Abraham; 3, Stewart Adamson. Shearling ewe: 1, Stewart Adamson; 2, and 3, James Donaldson. Ram lamb: 1, James Donaldson; 2, and 3, Harry Wright and G Abraham. Ewe lamb: 1, and 2, James Donaldson. Pair of lambs: 1, James Donaldson; 2, Harry Wright and G Abraham. Champion: S and W Bell. Reserve: Richard Graham. Ram, one shear and upwards: 1, S and W Bell. Ewe, two-years-old and upwards: 1, Kenneth Dodds; 2, S and W Bell. Shearling ewe: 1, Paul O’Connor; 2, Richard Graham. Ram lamb: 1, Richard Graham; 2, and 3, Kenneth Dodds. Ewe lamb: 1, S and W Bell. Champion: Wallace Clarke. Reserve: RJ McCauley. Ram, two shear and upwards: 1, Wallace Clarke; 2, A and m McConnell. Ram, one shear and upwards: 1, Wallace Clarke. Ewe, two-years-old and upwards: 1, RJ McCauley; 2, Kerry Angus; 3, RJ McCauley. Shearling ewe: 1, Wallace Clarke; 2, Kerry Angus; 3, Smyth. Ram lamb: 1, and 2, Wallace Clarke; 3, A and M McConnell. Group of three: 1, Wallace Clarke; 2, A and M McConnell. Champion: Jim Bell. Reserve: Bertie McAfee. Shearling ram and older: 1, Jim Bell. Ewe, two-years-old and upwards: 1, Jim Bell; 2, Harold McBratney; 3, Jim Bell. Shearling ewe: 1, and 2, Jim Bell; 3, Harold McBratney. Ram lamb: 1, Bertie McAfee; 2, Drew and Stephen Cowan; 3, David Cromie. Ewe lamb: 1, and 2, Drew and Stephen Cowan; 3, Jim Bell. Group of three: 1, Jim Bell. Champion: Alison Graham. Reserve: Alison Graham. Ram, one-year-old and upwards: 1, S and J Kerr. Ewe, two-years-old and upwards: 1, Alison Graham; 2, S and J Kerr. Shearling ewe: 1, Alison Graham; 2, S and J Kerr; 3, Alison Graham. Ewe lamb: 1, and 2, Alison Graham; 3, S and J Kerr. Ram lamb: 1, and 2, S and J Kerr. Champion: Desmond Sloan. Reserve: Branagan Bros.
Ram, two shear and upwards: 1, Martin Johnston; 2, Patrick Brannigan. Shearling ram: 1, Niall Brown. Ewe, two-years-old and upwards: 1, and 2, Ciaran Killen; 3, Martin Johnston. Shearling ewe: 1, Ciaran Killen; 2, Niall Brown; 3, Branagan Bros.
Ram lamb: 1, Desmond Sloan; 2, Ciaran Killen; 3, Desmond Sloan. Ewe lamb: 1, and 2, Branagan Bros; 3, Ciaran Killen. Pair of ewe lambs: 1, and 2, Branagan Bros; 3, Niall Brown. Ewe with lamb at foot: 1, Ciaran Killen; 2, Desmond Sloan; 3, Niall Brown. Pair, property of exhibitor: 1, Ciaran Kerr; 2, Desmond Sloan; 3, Ciaran Kerr. Ram, two shear and upwards: 1, Seamus and James Fegan; 2, Dermot and Oisin Kelly; 3, Kevin McCullough. Shearling ram: 1, and 2, Seamus and James Fegan; 3, Colm McAteer. Ewe, two-years-old and upwards: 1, James and Patrick Murray 2, Sam Wallace; 3, Daniel Harrison. Shearling ewe: 1, Seamus and James Fegan; 2, Grant Bros; 3, Seamus and James Fegan. Ram lamb: 1, Seamus and James Fegan; 2, and 3, Kevin McCullough. Ewe lamb: 1, and 2, Seamus and James Fegan ; 3, James and Patrick Murray. Group of three: 1, Seamus and James Fegan; 2, James and Patrick Murray; 3, Sam Wallace. Ram, one shear and upwards: 1, Shane Wilson; 2, Kyle Bradshaw; 3, CD and J Knox. Ewe, two-year-old and upwards: 1, Shane Wilson; 2, John Wilson; 3, Aaron Fearon. Shearling ewe: 1, Shane Wilson; 2, Mark Truesdale; 3, Ellen McClure. Ram lamb: 1, John Wilson; 2, Ellen McClure; 3, Andrew Knox. Ewe lamb: 1, Ellen McClure; 2, C, D and J Knox; 3, Kyle Bradshaw. Champion: Barry Latimer. Reserve: C and A Kennedy. Ram, two shear and upwards: 1, Barry Latimer; 2, C and A Kennedy; 3, Aidan McConville. Shearling ram: 1, and 2, C and A Kennedy; 3, Barry Latimer. Ewe, two-years-old and upwards: 1, C and A Kennedy; 2, Russell Millen; 3, C and A Kennedy. Shearling ewe: 1, Barry Latimer; 2, asnd 3, Seamus Killen. Ram lamb: 1, Robert Eileen Edwards; 2, C and A Kennedy; 3, Russell Millen. Ewe lamb: 1, Barry Latimer; 2, C and A Kennedy; 3, Russell Millen. Champion: C and D Cromie. Reserve: Jack Owen. Ram, any age: 1, C and D Cromie; 2, Mark Morris. Ewe, two-years-old and upwards: 1, Niamh Brannigan. Shearling ewe: 1, Jack Owens; 2, and 3, Brian Malcolmson. Ram lamb: 1, and 2, C and D Cromie. Ewe lamb: 1, and 2, C and D Cromie; 3, Jack Owens. Pair, property of exhibitor: 1, Brian Malcolmson; 2, Jack Owens; 3, C and D Cromie. Group of three: 1, C and D Cromie. Young handler, aged 8 to 14 years-old: 1, Mark Norris; 2, Jack Owens. Champion: Daryl Moffitt. Reserve: Daryl Moffit. Ram , any age: 1, and 2, Daryl Moffit. Ewe, any age: 1, and 2, Daryl Moffit. Shearling ram: 1, and 2, Daryl Moffit. Shearling ewe: 1, 2, and 3, Daryl Moffit. Ram lamb: 1, 2, and 3, Daryl Moffit. Ewe lamb: 1, 2, and 3, Daryl Moffit. Champion: Drew and Stephen Cowan. Reserve: L Jamison. Ram, any age: 1, L Jamison; 2, Thomas Edgar; 3, L Jamison. Ewe, any age: 1, Drew and Stephen Cowan; 2, Thomas Edgar; 3, Drew and Stephen Cowan. Ram lamb: 1, Thomas Edgar; 2, L Jamison. Ewe lamb: 1, Thomas Edgar; 2, L Jamison. Champion: Harold McBratney. Reserve: Alice Cochrane. Ram, any age: 1, Alice Cochrane; 2, S and J Kerr; 3, Harold McBratney. Ewe, any age: 1, Harold McBratney. Shearling ewe: 1, and 2, Alice Cochrane. Ram lamb: 1, Alice Cochrane; 2, Harold McBratney. Ewe lamb: 1, Alice Cochrane; 2, and 3, Harold McBratney. Pen of three by continental sire: 1, Henry Gamble; 2, Samuel McKibben; 3, Brendan Gilchrist. Handler, up to 10-years-old: 1, Lola Woods; 2, Sarah Gilchrist; 3, William Bell. Handler, 10 to 14 years-old: 1, Niamh Smyth; 2, Liam Doyle; 3, Sam Todd. Champion: Arthur Mullan. Reserve: Nicky Haynes. Best goatling: Nicky Haynes. Reserve: Marie Cherry. Best kid: ED and M Galbraith. Reserve: Geoffrey Ringland. Milker, British Alpine: 1, Nicky Haynes; 2, Lindsay Greer; 3, Nicky Haynes. Milker, British Saanen: Geoffrey Ringland. Milker, any other variety: 1, Arthur Mullan; 2, Geoffrey Ringland; 3, V Drew. Goatling, Anlgo Nubian: 1, MD Gilmore. Goatling, British Alpine or British Toggenburg: 1, Nicky Haynes; 2, Marie Cherry; 3, Nicky Haynes. Goatling, British Saanen: 1, ED and M Galbraith. Goatling, any other variety: 1, V Drew; 2, Marie Cherry; 3, V Drew. Kid, Anglo Nubian: 1, S Wilson; 2, MD Gilmore. Kid, British Alpine or British Toggenburg: 1, Arthur Mullan; 2, ED and M Galbraith; 3, Nicky Haynes. Kid, any other variety: 1, ED and M Galbriath; 2, Geoffrey Ringland; 3, Arthur Mullan. Champion: Sam McConnell. Reserve: Rowan Cairns. Fleece from Blackface, Swaledale or Herdwick: 1, Sam McConnell; 2, Dale McConnell. Fleece from Hampshire Down, Suffolk, Dorset Down, South Down, Oxford Down, Shropshire or Ryeland: 1, and 2, Sam McConnell; 3, Dale McConnell. Fleece from Border Leicester, Romney, Bluefaced Leicester, Mule, Greyface, Cheviot and Lleyn: 1, Dale McConnell; 2, Sam McConnell; 3, Martin Fitzpatrick. Fleece from rare or minority breed: 1, Dale McConnell; 2, Rowan Cairns; 3, G and J Newell. Fleece from any other breed or crossbred: 1, and 2, Rowan Cairns; 3, Dale McConnell. Class 50 – 1,2 and 3 years old colt, gelding or filly 1. Sharon Cumberland – Ronelle Indigoe Rose. Class 69 Agricultural horse (over 14.2hh) 2 or 4 wheeler: 1.